Another prototype LG Nexus (LG-E960) has surfaced over at XDA and the owner is taking questions from curious onlookers. The pictures itself aren’t all that new, but he’s confirming specs and any other detail that you can throw at him. So far, he has confirmed that the device only has 8GB of internal storage and he hasn’t found a microSD slot yet. This matches up to an earlier rumor that suggests there would only be 8GB and 16GB options, a move we assumed was done to keep the price ultra low. This lucky new Nexus owner said that the processor is a Snapdragon S4 Pro quad-core chipset clocked at 1.5GHz. It has 2GB RAM, an 8MP camera, 768×1184 (slightly different than what we saw earlier in a benchmark). 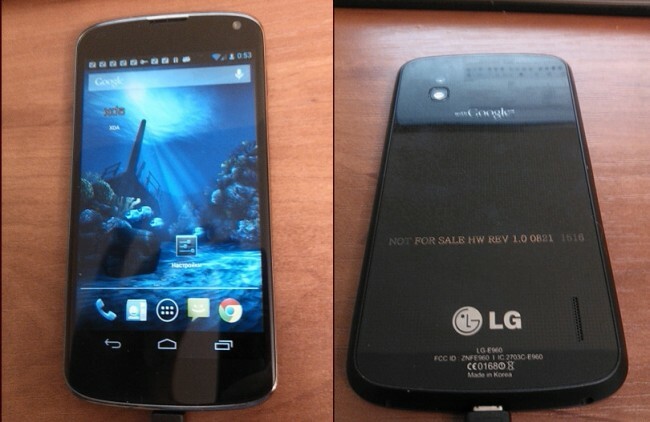 The device does not have an LTE chip and is about the same thickness as the Galaxy Nexus. To find out more, I suggest you hover at the XDA thread below and wait for him to answer more questions.